Nike’s consumer brand perception has held on and even rebounded quickly over the past several weeks, despite a series of damning articles about the company’s “boys club culture” and notable executive departures, according to YouGov BrandIndex. Only once did Nike’s consumer perception take a sharp drop since stories began appearing in mid-March, but that was relatively short-lived. One of the most striking parts of YouGov BrandIndex’s data has been that women have more consistently had a more favorable view of Nike than men during this tumultuous period. Quick action and transparency on the part of CEO Mark Parker. Nike is a relatively “Teflon” brand that leads its rivals in all YouGov BrandIndex perception metrics. It has endured greater affection than other companies and industries, which are far more sensitive to trouble (like airlines, dining chains, and cable networks). It is possible that this is a similar phenomenon to what happened with major credit card data thefts that began eight years ago: the first incidents created the biggest drops in perception, but after they occurred regularly, the drops become less severe. There has been no shortage of press coverage on Nike’s workplace issues. The New York Times, The Wall Street Journal, Fast Company, and many other media companies have published reports on executive behavior issues, leadership shakeups, and a toxic environment for women from March through this past weekend. During that period, CEO Mark Parker issued a memo about “conduct inconsistent with Nike’s core values” and the HR chief admitted that the company was not doing a good enough job hiring and promoting women and minorities. Throughout that period, Nike’s consumer perception didn’t shift in any major way with one exception: around April 19th, three Nike executives – Vikrant Singh, Daniel Tawiah, and Antoine Andrews – left the company at once. That news apparently sent Nike’s perception tumbling to its lowest point of the year a week later on April 26th. Since then, even after a blistering New York Times report about the company’s internal women’s revolt published this past Saturday, Nike’s perception rebounded to its normal levels. 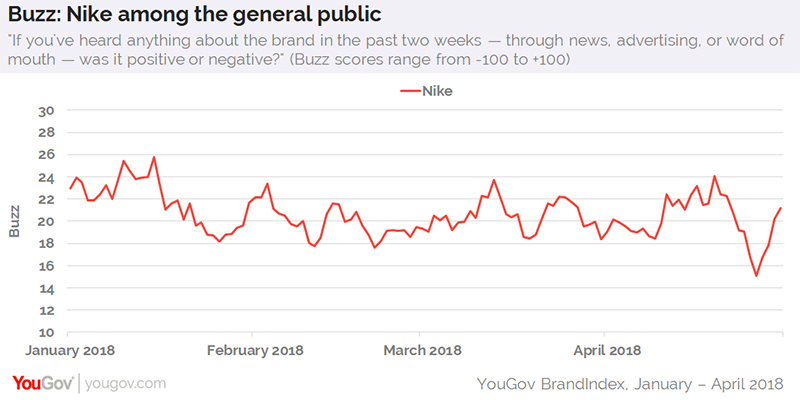 Nike’s consumer perception was measured using YouGov BrandIndex’s Buzz score, which asks respondents: "If you've heard anything about the brand in the past two weeks — through news, advertising, or word of mouth — was it positive or negative?"